18 seems to be the magic number. Magic number for what? 18 is the point margin of victory for teams who have defeated the Toronto Raptors over the weekend. First the Phoenix Suns came to town and won by 18 on Friday night. Tonight (i.e. 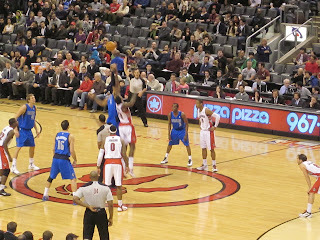 Sunday night) the Dallas Mavericks came into the Air Canada Centre and defeated the home team by the same margin. Dirk Nowitzki was the hero of tonight's game by dropping 31 points and collecting 13 rebounds. 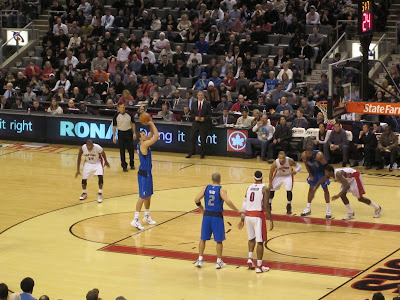 Shawn Marion added 20 points to the winning effort. For the Raptors, Andrea Bargnani didn't play. Amir Johnson had 21 points and DeMar DeRozan added another 19 points in tonight's losing effort. Here's a picture I had to take of a little boy in a Chris Bosh jersey. 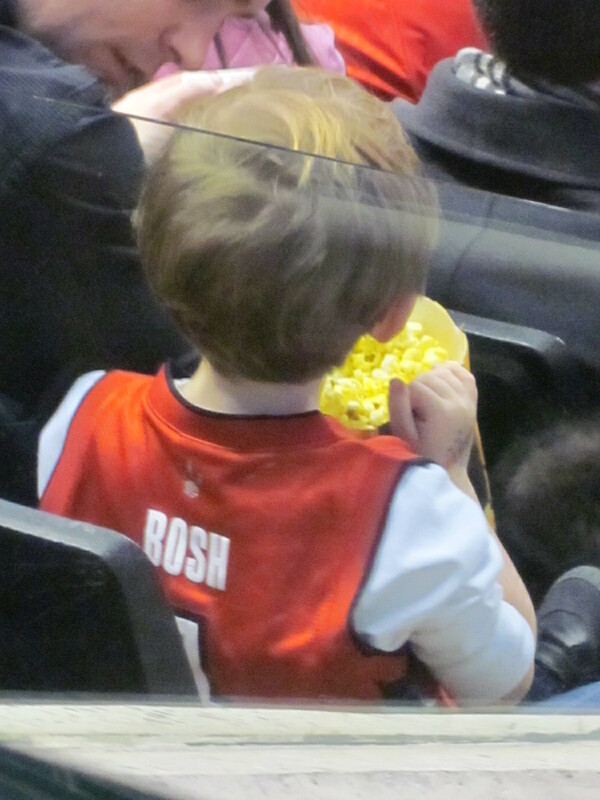 I realize Bosh played for the Raptors for many years, but can we please upgrade this boy's jersey? He shouldn't have to have Bosh's name on his back. The Dallas Mavericks were just in Washington DC on Saturday night, so maybe that explains the Mavs' slow start tonight. The Raptors came out hot in the 1st quarter. Dallas held the lead initially (i.e. when Dirk Nowitzki scored the 1st bucket of the game) but then the Mavericks' offense was missing in action for quite a while. At one point the Mavs were down by a score of 22-3. Finally in the 3rd quarter, thanks to a bucket from Shawn Marion the Mavericks took the lead 62-61, and the Mavs never really looked back. Tonight's match-up wasn't much of a ball game, but it was a good one if you were rooting for the Mavs. Mark Cuban was sitting behind the bench watching his team closely. As the Raptors came out to shoot around after half time, a few of them went over to shake his hand. I'm sure a few of them wouldn't mind playing for him at some point in their careers. The final score for tonight's game was 116-94. Mavericks earned the "W". 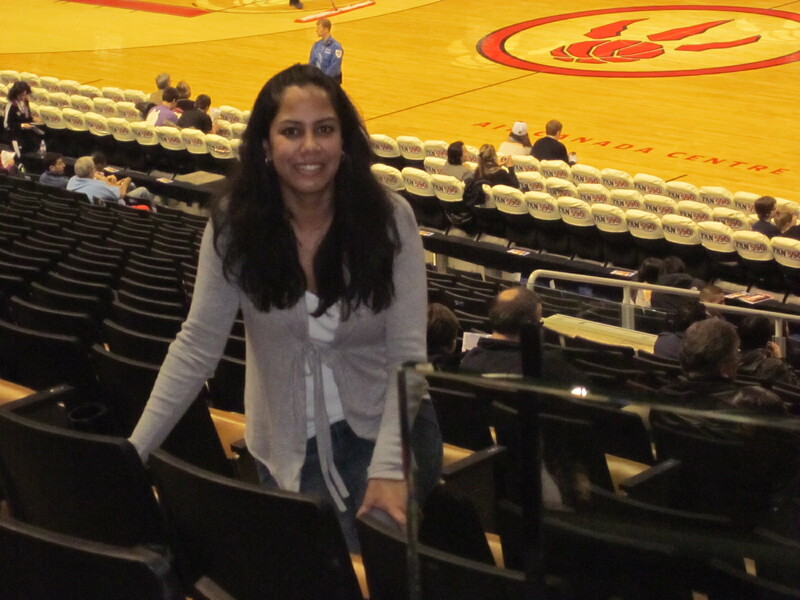 **** My stint in Toronto has come to an end. 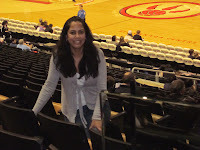 I've enjoyed my return visit to this city, and the couple of games I was able to watch this trip. Thank you, Toronto, for a great time!